Students and non-students have auditioned to have their voices heard in the Wits Young Choir. 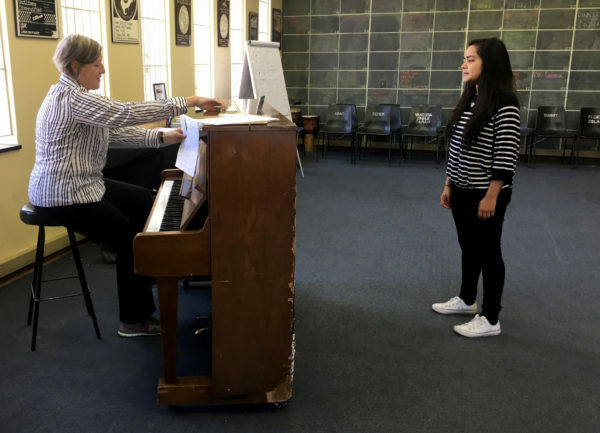 The Wits University Young Choir (WYC) held its second set of first-round auditions on Monday, August 20, at the choir’s premises in Braamfontein. A total of 45 people, consisting of both Wits community and non-Wits members, showcased their vocal talents to conductor Dalene Hoogenhout, who has been conducting at Wits since 1994. Hoogenhout told Wits Vuvuzela that there is no limit as to how many people are accepted into the WYC and the final decision is based on how well an individual can hear music. “I look for an ear in an individual as I can work on a voice if they can hear music well,” she said. “The only limit we have for the WYC is that individuals cannot be younger than 18,” the conductor added. Bandisilwe Sontashe, 21, an alto member of the WYC, told Wits Vuvuzela that it does not matter what you study or what your background is, all you need is a passion for music. “Being in the choir is fun. It’s overwhelming but I’ve learnt a lot about music,” the third-year engineering student said. Amongst those who came to audition was first-year Bachelor of Music student Maithili Shome. Since coming to Wits, the 18-year-old has been a fan of both Wits choirs. Both Wits choirs have always strived to be as diverse as possible with their motto being ‘Excellence Through Diversity’. The songs that they sing are reflective of the languages across the African continent. The WYC currently consists of 45 members between the ages of 18 and 55 and is the entry point into the Wits Choir, the main university choir. The choir members include undergraduate, postgraduate and doctoral students, and even academic staff. “We even have lecturers in medical school to professionals who are engineers and actuaries,” Hoogenhout added. Wits Choir member, Malcolm Tafira, who was an original WYC member when it started in 2014, said, “The WYC is open to everybody and because of that it creates a great energy. “It’s one great way for [individuals] to come de-stress and a lot of us use music as therapy,” the third-year BA Law student continued. The new members of the WYC are expected to join the existing members for their first practice on Tuesday, August 28.